This website is dedicated in the memory of Dr Bijoy Bhusan Hazarika who was an extraordinary historian of Assam’s history. Dr Hazarika who is no more among us was extraordinary because he was himself a part of the history which he described in his writings. Dr Hazarika hailed from Tarapur village near Silchar town of the southern Assam’s Barak valley region.He was born there in 1933 to Mr Rabiram Hazarika and Basantalata Hazarika. He was married to Mrs Neelima Hazarika who was from North Guwahati township and he settled in the South Sarania locality of Guwahati city. He was perhaps the most prominent amongst the Man-bhaganiya Assamese people. Dr Bijoy Bhusan Hazarika was the only Assamese historian to have dealt with in detail the most crucial period of Assam’s history the period of Burmese occupation of Assam and the consequences thereof. 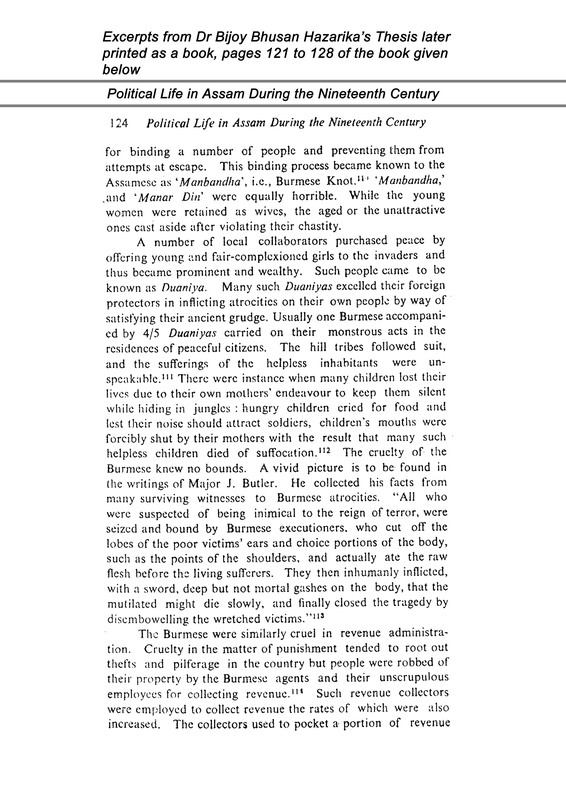 Dr Hazarika’s doctoral thesis “Political Life in Assam During the Nineteenth Century” which was later published as a book dealt with this subject in depth and he is the only historian who has dealt with this period in a manner in which no one else has done till now. Although he himself was a part of the history which he described, his description preserved all the characteristics of scholarly and historical neutrality. 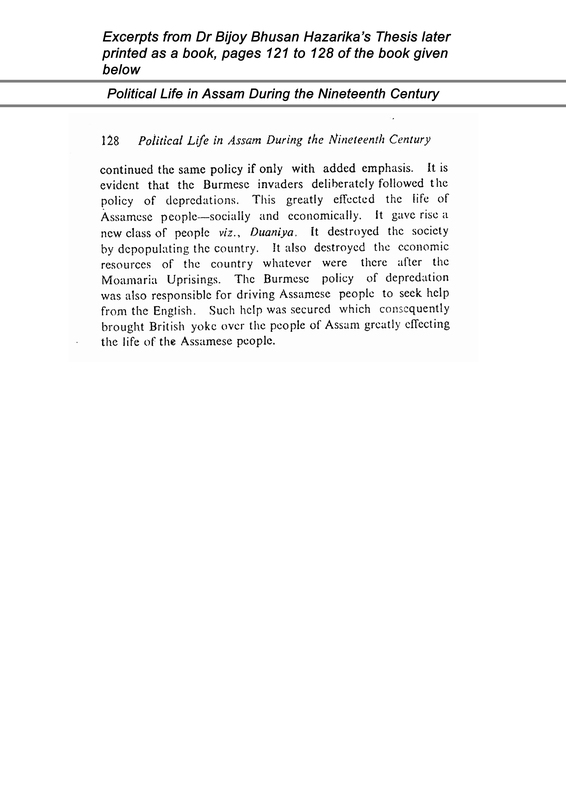 There is no better mention of the fate of the Assamese people displaced by Burmese depredation than that given by him. 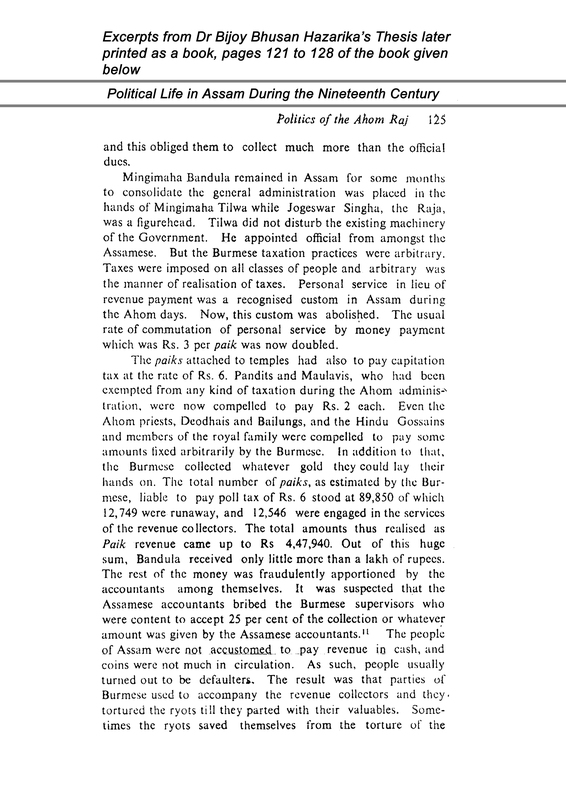 These displaced Assamese were forgotten by the mainstream of the Assamese intelligentsia, even now even the some of the best educated of the Assamese are totally ignorant of these people who were scattered all over the Barak valley, Sylhet and many of them totally cut off from the Assamese connection to land up in Tripura and Chittagong area. I had the fortune to be associated with this scholar since 1987 till the time of his death. A humble publicity shy intellectual, he was a constant source of encouragement for me. 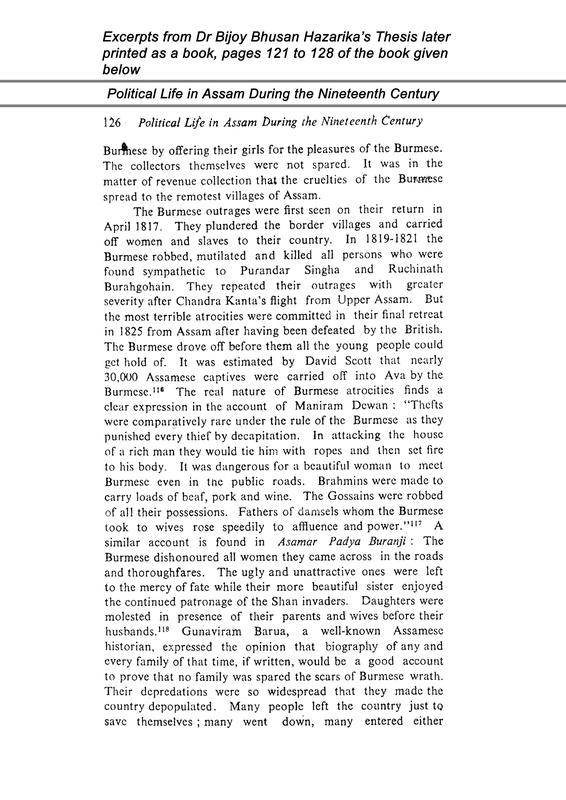 Dr Hazarika tried to find out the status of the Assamese people who were there in Burma (Myanmar), whose ancestors were carried off there by the Burmese invaders in the early part of the nineteenth century. He wrote several letters to the Universities of Rangoon and Mandalay to know the conditions of the Assamese there but no reply came. 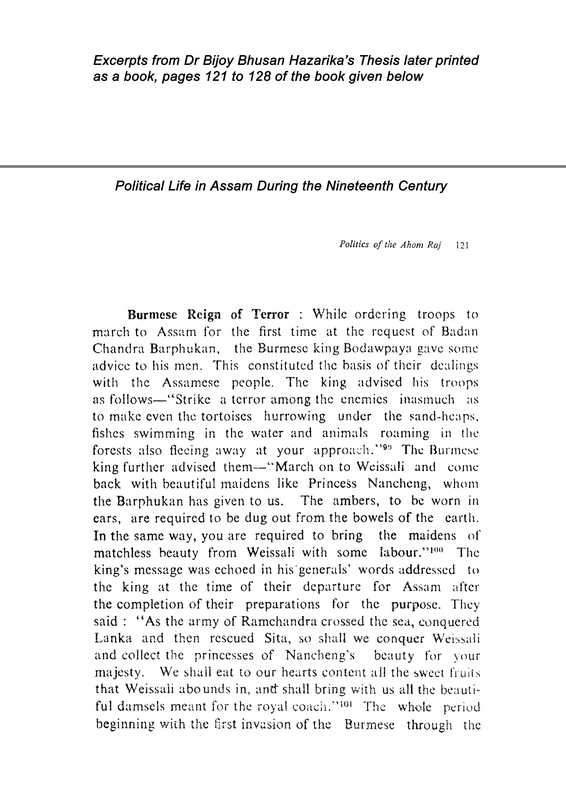 It was through his connections that I undertook visits to see the Man-bhaganiya Assamese people of Tarapore near Silchar and those settled in Bamungaon area of Lanka area of Nagaon district. Dr Bijoy Bhusan Hazarika served as Director , Directorate of Historical and Antiquarian Studies Government of Assam from 1974 to 1986 and then he was the Chief Editor of The District Gazetteer in Guwahati from 1986 till his retirement in 1991. He passed away in 1995 at Guwahati. Excerpts from his book are pasted below, for pdf version click on the link at the end of these pages. Posted in Dr Bijoy Bhusan Hazarika. Bookmark the permalink.